This juicy and flavorful grilled barbecue chicken will soon become your go-to grilling recipe! 1 MIX Hellmann's® or Best Foods® Real Mayonnaise, barbecue sauce and green onions in medium bowl. Reserve 1/2 cup. Coat chicken with remaining mayonnaise mixture; let stand 10 minutes. 2 GRILL chicken until thoroughly cooked, about 12 minutes. 3 SERVE chicken with reserved mayonnaise mixture. TIP: Also terrific with Hellmann's® or Best Foods® Mayonnaise Dressing with Olive Oil. 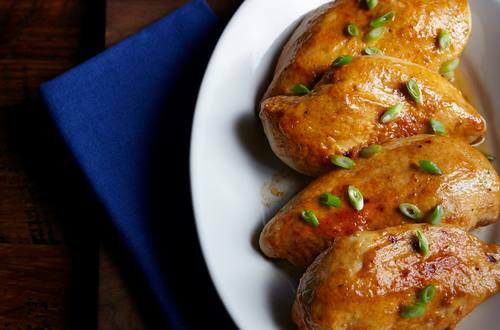 TIP: The chicken can also be baked instead of grilled. Arrange on baking sheet and bake in a 425° oven 20 minutes or until thoroughly cooked.